 Play Product Video Bellow  Just scroll down to "Related Video Shorts"
7 colors in 1 Get all the colors you need in one product. Why choose only one color? There are so many variations in our lights that you don't need to purchase multiple LED bike lights.  USB Rechargeable You do not need to spend money on batteries.  Save hundreds on batteries.  Strong Silicone Tube Cover - Designed with a strong silicone tube cover so there's no worry about the lights breaking. Do not buy a bicycle wheel lights without a silicone tube cover. ⛈️Waterproof & All Weather Use - Use the bike wheel lights in all weather conditions without a worry.  3 Light Modes - Easily change between Single Color Mode, Color Change Mode, and Pattern Shuffle Mode. 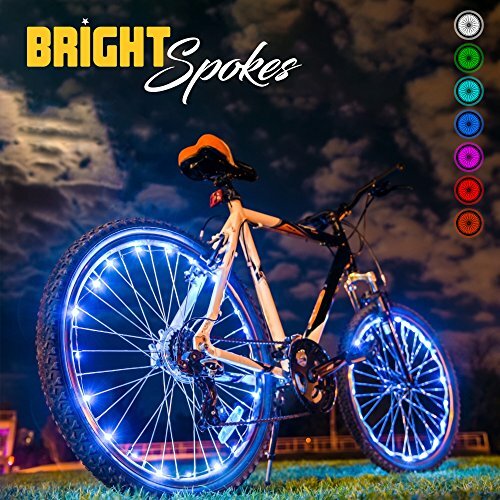 Flashy and safe, unique bike rim lights makes your cycling movement more fun and safer at night.  Premium Gift Box - The best solution for a present for boys and girls at all ages.  Easy Installation - Install in minutes, no tools required! ‍‍‍For All Bikes - Works with almost all standard bike wheels, also can be mounted on the bike frame. We stand behind our products. Full 1 Year Warranty on all orders. Guaranteed Friendly & Professional Customer Support, 24/7.  Gift for all Ages - 9 year boy birthday gift  11 year old boys gifts  gifts for 10 year old boy  5 year old boy gifts  4 year old boy gifts  5 year old girls gifts  8 year old girl boy gifts  birthday gifts for boys and girls at all ages.  7 COLORS & 3 LIGHTING MODES: Just press the button and choose the color you want: Red, Blue, Green, Purple, Yellow, Cyan-blue or White. You can choose steady mode, automatically color change mode or pattern shuffle mode.  NO MORE BATTERY PURCHASES: Just use our upgraded USB rechargeable Li-ion battery. Super fast charging, works for many hours and rides! Simply recharge by connecting to notebook, computer, phone charger or other USB power source.  BICYCLE LED LIGHTS WITH SILICONE PROTECTION & 360 VISIBILITY: We designed our bicycle rim lights with a strong silicone tube cover. Makes your LED bike lights waterproof, so you can use it in any weather and any time of year.  PREMIUM FULL COLOR GIFT BOX: Our premium bike wheel lights are perfect gift for kids and adults, men and women, boys and girls. Fits most of the bikes from 12'' toddler bikes to 29'' adult bicycle with standard spokes. If you have any questions about this product by Gear Nation, contact us by completing and submitting the form below. If you are looking for a specif part number, please include it with your message.